I’ve always loved spring. To me I’ve always associated it with hope, love, and beauty. I love the new flowers that start to pop up and the green blades of grass. When I start to see dandelions I know that spring has arrived. In my elementary school years I was pretty healthy. I hardly ever got sick or missed school. My brother on the other hand suffered from asthma and allergies. My dad used to joke that he was allergic to everything except girls. When I worked in the corporate world I noticed that I was getting sick all the time so I scheduled doctor appointments frequently. I remember going every week for about a month. Each time I visited the doctor he’d give me some Claritin. I eventually figured out that the Claritin did nothing for me and that it was the stress from work and my poor diet that was causing my allergies. When I left the corporate world and fixed my diet my allergies went away. When someone suffers from allergies it’s a gut issue or an autoimmune condition. I’ve seen it and studied it many times. Whether it’s environmental or food allergies anyone can heal them. I’ve been advocating the solution for some time now. Eat organic, local, and seasonal. Not everyone understands the concept of eating local and seasonal. It’s pretty simple. If something doesn’t grow in your area don’t eat it or don’t eat it all the time. People don’t understand this idea because we have access to foods from all over the world in grocery stores. I live in New York but bananas don’t grow here. I rarely eat bananas because they're not part of my environment and they won’t strengthen my microbiome. This is why I’m big into CSAs and I believe this is the reason why my immune system over the last three years has improved immensely. Before I moved to New York my gut health was not its best. I had just gone through a few traumatic years of health problems. I was so weak and so vitamin deficient I thought that I was dying. People don’t have to suffer. People don’t have to accept a sick body. Get with a certified health coach or wellness practitioner. Run past the fear and trust the process because this process that I and many others teach really does work. Since becoming a New Yorker I've been embracing New York products and services because I believe in supporting our local economy. I think it's natural to be proud of where one lives and what the area offers. Not too long ago I was messaging my cousin recommending my favorite gluten free pasta brands on Thrive Market. As she was browsing the site she excitedly informed me that Thrive Market carries Rao's marinara sauce. Rao's is one of the best Italian restaurants in New York and has been bottling their special sauce for years because it's that popular. So I decided to order some bottles of Rao's marinara sauce and give it a try in making spaghetti sauce. I think the results were spectacular so every time I make spaghetti sauce I use Rao's. I love the product and I love that it's from New York! Now I just need to make it into New York City and reserve a seat at one of Rao's restaurants. I like meat in my spaghetti sauce so I use either local, pasture raised sweet Italian sausage or local, grass fed ground beef from my CSA Greyrock Farm in Cazenovia. They sell quality meats and it really makes a difference in taste. I also add anchovies. Anchovies are one of those important foods that is so overlooked. People immediately think, "Yuck, I will never eat anchovies. It's smelly and gross." They have it all wrong -- anchovies are true brain food. And if your children don't like anchovies, just don't tell them that you put it in their spaghetti sauce. They will never know! I recommend using as much local, organic produce as possible. I am fortunate because my CSA carries a lot of the ingredients I use for my spaghetti sauce. I also don't mind traveling to other local, organic farms for my vegetables. This spaghetti sauce is so flavorful and delicious, and like most sauces, its taste improves if aged a day or two. If I can get the pickiest eaters that I know to eat it I think it's a winner! In a large stainless steel pot, brown the sausage. Add the onion and a dash or two of Himalayan pink sea salt to break up the cellulose fiber and saute for 2 minutes. Add the garlic. Saute for a minute. Mash in the anchovies and mix in with the other ingredients. Add the marinara sauce, the herbs, and the water. Simmer for at least 30 minutes. Stir occasionally. Try this with a good organic pasta preferably made in Italy. If you want to try gluten free pasta, try Jovial or Ancient Harvest brands. I've been meaning to continue my thoughts on local food in Central New York but I just haven't been able to pen anything due to my little boy's very busy schedule. Summer flew by just as it always does and my son is growing up way too fast! Can I just get a little breather?! In Syracuse there are a ton of Italian establishments but I like to look for restaurants that use wholesome, local, and organic ingredients. Food not only should taste delicious but it really should be sourced locally from organic farmers in your area. This just makes sense environmentally and economically. Take for instance kale that was grown in Half Moon Bay, California versus kale that was grown in Skaneateles, New York. Since I live in Central New York doesn't it make sense to choose the one from Skaneateles? But every day consumers are thinking of convenience first instead of how much gasoline was used to ship those greens from California, the innumerable benefits of local organic farming to the local community, and the vitamins and nutrients that have already been depleted from those greens grown in California because of travel time. One of my favorite local restaurants in Syracuse takes these simple ideas to heart and incorporates them into their outstanding menu and business plan. That's why I love patronizing Apizza Regionale located right across the famous Dinosaur Bar-B-Que. They source their flour, meats, cheeses, and vegetables from purveyors of organic and local goods. I've tried their pizzas, salads and pastas at Apizza Regionale. What I appreciate about the organic flour is that it is fermented for 72 hours to create a very light and delicious tasting crust. It doesn't make me feel bloated or overly full after eating a couple of slices. You know that feeling of "oh my gosh I ate too much!" Beforehand I usually have the Cavoletti which is comprised of some nice Brussels sprouts and pancetta and the Cavolo Nero which is a nice kale salad. 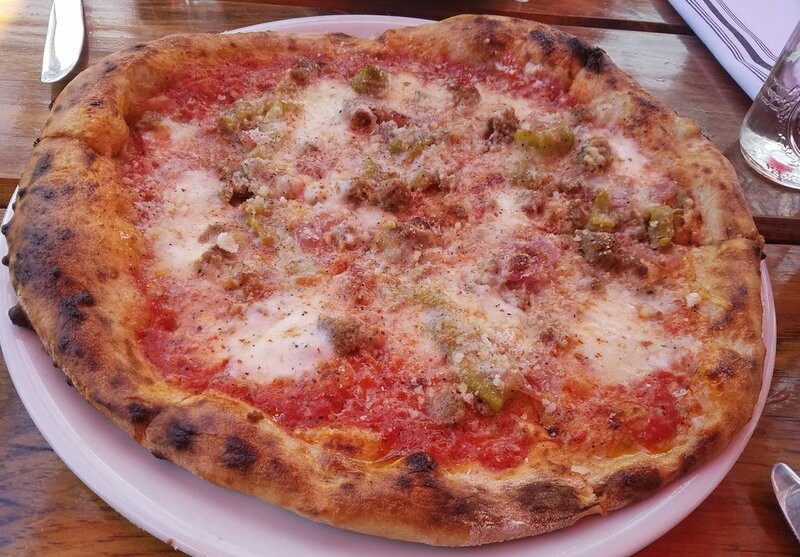 I just adore the Salsiccia pizza because it has a wonderful bite to it and because I always love sausage (theirs is homemade) on my pizza. The Ruccolo is another delightful gourmet pizza topped with arugula and smoked prosciutto. One rule that I have to follow when going to Apizza Regionale is to never miss out on dessert. They unfortunately do not make larger sizes of their Olive Oil Cake. I wish they did because I would seriously buy a large size and serve it for special parties and get togethers. They also offer the Chocolate Hazelnut Budino which is on the sweet side but if you're a chocolate and hazelnut lover, why not, indulge a little! My family and I prefer going for lunch and sitting outside on nice days. It's more quiet and less crowded. It is a very popular place after all. Also, the staff is very accommodating. When I asked for the Cavolleti with Brussels sprouts they kindly informed me that the appetizer is normally served during dinner but they served it for me and my family when we went for lunch one afternoon. Apizza Regionale offers the best pizza in the Syracuse area. Central New York friends, you are missing out if you haven't been. No one in town can beat their fresh, organic, local ingredients and their fabulous crust. Pizza never tasted so good! I got the best compliment not too long ago. It was really sweet and it warmed my heart. We had our very good friends over for dinner. I decided to serve something delicious and kid-friendly because I knew that our friends' youngest is a picky eater. After dinner our friends' youngest came up to me and softly whispered, "That was my favorite dinner." I was so surprised but very touched. Just a couple of weeks ago my husband and I packed lunch for my parents who were returning back to Virginia. They spent almost two wonderful weeks with us visiting and exploring our area in Central New York. Midway through their trip I got a call from my mom. She said that they were about to board again and that my dad asked her, "Why do Elaine's burgers taste better than mine?" So good old fashioned burgers it was but with a healthy twist! What makes these burgers are the local, organic ingredients that I put in them. Fresh and local is really best! It's important to find top quality, premium ground beef. I get my ground beef from our CSA in Cazenovia, New York. Greyrock Farm sells grass fed meats sourced from local farmers. I've tasted grass fed meats from the grocery store and sincerely they cannot compare to the grass fed and pasture raised meats I buy from Greyrock Farm. Another important ingredient in making the best homemade burgers is to use pasture raised eggs. Pasture raised eggs are not the same as organic eggs, cage free eggs, or vegetarian fed eggs. Pasture raised eggs have incredibly deep orange colored yolks and have more vitamins than all the other eggs out there. So look for pasture raised eggs at the grocery. Better yet find a CSA or local farmer who raises chickens out in the open pastures. Happy chickens will lay the healthiest, most nutrient dense eggs. Herbs give this burger recipe nice flavor and added health benefits. Many people overlook culinary herbs but they can actually help with certain ailments. I love using a variety of herbs for this recipe. You can get organic herbs in the grocery store but I especially like growing my own in my vintage herb planter. So here you go! Try my favorite healthy burger recipe. It's perfect for summer cookouts or just whenever you're craving a delicious homemade burger. Place all the ingredients except the condiments in a large mixing bowl and mix well. Shape your burgers into 4 equally sized burgers. Grill or pan fry your burgers. Place on toasted hamburger buns and add condiments. Enjoy! MacDonald Farms Mom's Zesty Brown Mustard. I've never really been a mustard fan until I tasted this brand. If you live in Central New York you need to pick up this mustard. It is so good in burgers and any kind of sandwich or recipe that calls for mustard. Look for raw local mustard in your area! Affiliate Disclosure - This site is a participant in the Amazon Services LLC Associates Program, an affiliate advertising program designed to provide a means for sites to earn advertising fees by advertising and linking to amazon.com.